The Cincinnati Reds managed to make the opening game of the series against the Houston Astros look a lot closer than it really was. Mike Leake turned in another crappy start for the Reds, doing nothing to quiet those fans clamoring for Aroldis Chapman to join the rotation. Leake was unable to make it out of the 4th inning, and ended up charged with 6 runs–3 earned–on 7 hits and just 1 strikeout. At least he’ll be well rested for his next start. The bullpen came in after that and turned in their characteristic scoreless performance. Unfortunately, this time the Reds’ offense never really showed up. Watching the game, it felt like the hitters were not quite awake yet and didn’t really wake up until the second half of the game. 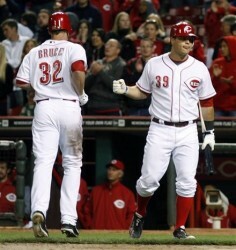 Jay Bruce scored the Reds’ first run in the 5th thanks to Todd Frazier’s pinch-hit triple. Of course, Frazier was left stranded on third. In the next inning, Joey Votto battled Astros’ starter Wandy Rodriguez and, after 13 pitches, hit a line-drive double that scored Drew Stubbs. The offense was silent until the 9th when they mounted a minor comeback attempt. Bruce and Devin Mesoraco tacked a back-to-back whackity-whack, but the hole Leake had created was too much. Hopefully, the Reds will come to today’s game awake before the game starts. Johnny Cueto will start against Lucas Harrell at 4:10pm EDT. Posted in Cincinnati Reds, Game Wrap, Houston Astros, NL Central.